Tokyo Otaku Mode Launches Full Graphic Evangelion Kimono Project! Tokyo Otaku Mode Inc. (incorporated in Delaware, U.S.; Representative Tomohide Kamei, CEO Naomitsu Kodaka; herein referred to as TOM) announces the launch of a project to create a full graphic furisode kimono designed with characters from “Evangelion: 3.0 You Can (Not) Redo”. 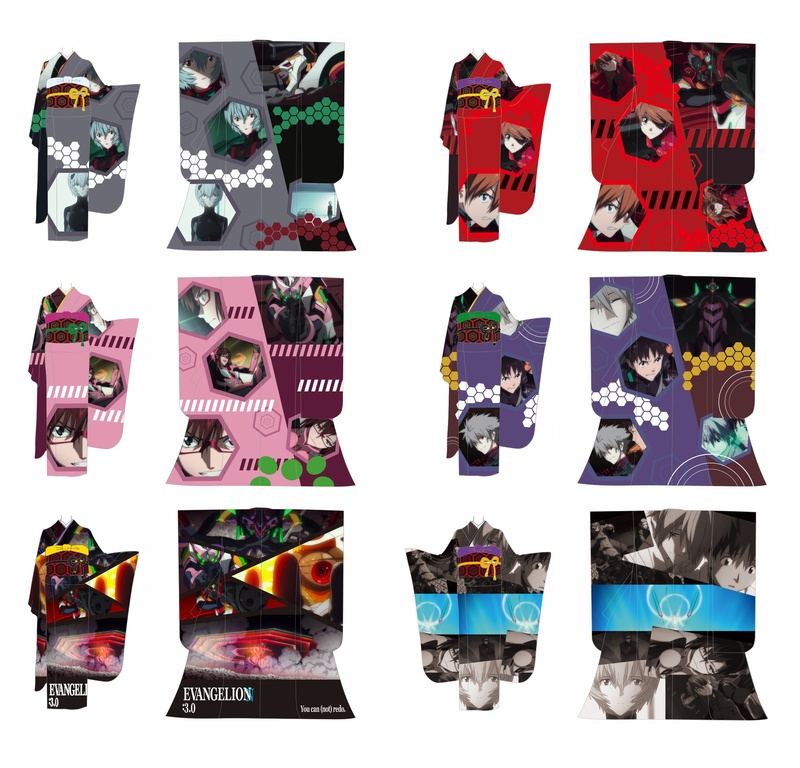 The project, titled Evangelion x Full Graphic Kimono, is being carried out through TOM’s product development platform, TOM Projects, and includes six possible designs that feature memorable scenes incorporating the main characters’ representative colors. Fans worldwide will have the chance to share their opinions on these designs through a survey, the results of which will be used to determine which design will ultimately be produced. Only 100 Evangelion x Full Graphic Kimonos will be produced and they will be made available for worldwide sale. The survey will be held through a special page on OtakuMode.com from October 14 to 31, with results being announced in mid-November. Since 2013, TOM has managed an ecommerce business centered on products related to Japanese pop-culture content geared toward fans worldwide. Now, with the launch of its product development platform, TOM Projects, the company is expanding into the development of original products. For this project, an entirely new product has been planned that fuses the traditional Japanese style of the furisode kimono with one of Japan’s most iconic anime series, Evangelion. Rooted in the concept of “developing products cooperatively with fans,” fans worldwide will be surveyed on six possible Evangelion x Full Graphic Kimono designs, with the final design being decided based on their input. The designs include each character’s representative color and incorporate memorable scenes from “Evangelion: 3.0 You Can (Not) Redo”. The Evangelion x Full Graphic Kimono will be produced using a digital dyeing method that combines dyeing techniques used since antiquity with modern technology. This method ensures that the colors and designs turn out as brilliant and precise as they were originally designed. Each kimono will be created by skilled kimono artisans from the initial design stage, and from the cloth cutting to the sewing, each piece of fabric will be carefully set without losing details from the design, resulting in a design that is gorgeous and eye-catching. The kimono will be painstakingly crafted entirely in Japan by a local dyeing company and tailor. This will be the first furisode kimono themed after Evangelion to ever be produced. Limited to 100 Only! Its Prominent Design Makes an Impact as Both Decor and Attire! A limited edition of just 100 of the Evangelion x Full Graphic Kimonos will be produced. With a design that is fitting even as room decor, it can be enjoyed even while not being worn. Its large size—165cm length and 136cm width when hung up—gives the design even more impact than a B0-size poster. The Evangelion x Full Graphic Kimono will be produced entirely in Japan, starting in Tokamachi, Niigata Prefecture, an area regarded for its traditional Japanese kimono production, where it will be dyed using a high quality digital dyeing method. The kimono will then be finished by a tailor in Fukuyama City, Hiroshima Prefecture with over 70 years of history which tailors and cleans kimonos through a comprehensive process to bring out their traditional aesthetic beauty. Evangelion, which started with the TV series “Neon Genesis Evangelion” that began broadcasting in 1995, is one of the most popular anime worldwide. Set after the global cataclysm Second Impact, the series depicts the young boys and girls who pilot humanoid battle weapons called Evangelion and their fight against mysterious invaders called Angels. In 2007 a new movie tetralogy titled “Rebuild of Evangelion” began, capturing the hearts of fans of all ages. Three movies in the tetralogy have been released to date. Tokyo Otaku Mode has managed a worldwide ecommerce site since 2013, and with the launch of its product development platform, TOM Projects, the company will begin collaborating with popular IPs and creators to develop original products. TOM is making diligent strides in order to bring original products to as many fans worldwide as possible. As the product lineup expands, TOM will consider more ways of developing products together with fans, bringing forth new developments and creations.